Orchids work hard creating flowers, so why not show them off! Enjoy the flowers! After all, isn't that why we grow these plants? The satisfaction of seeing blooms on a plant that you've nurtured along is immeasurable. This is you and mother nature making your world a little brighter. This is what growing orchids is all about! It's the blooming season! It's what we've been waiting for! This is your reward for pampering your plants thru their growing season (which can seem like forever!). The blooming season (for most orchids) begins in the fall and early winter - when the days are shorter and the temperatures have dropped. The 20 degree (or more) temperature difference between day and night triggers a blooming cycle. When flowers appear, move your orchids out of their stogy growing area and into a spot where everyone can enjoy those prize winning blooms. Grower Tip: Wait until the first couple of flowers open before moving your plant out of the growing area. By waiting you can be assured that your plant has stored up enough energy to complete the bloom cycle, no matter where you display it. Orchids have internal calendars marking thier seasons, and they vary with each type of plant. Some orchids bloom in summer, and others bloom in winter. Some bloom for only a week, others display flowers for three months or more! Light: Your plant has stored up all the energy it needs to for flowering. Light levels aren't critical and sunlight isn't necessary. In fact, flowers last longer away from the heat of the sun. A cool spot with good air venilation is best. Water: Be careful with the water. Water only to 1/4 on the gauge. Then make sure to wait until the plant is completely dry before rewatering. More water (and more nutrients) DOES NOT make more flowers. Temperature: Cool temperatures away from sunlight prolongs the life of the flowers. Orchids always appreciate fresh, cool air, especially when blooming. Avoid air-conditioning drafts however. Nutrients: Now is a good time to switch to a "Bloom" nutrient. Bloom nutrients are formulated to for bigger, better flowers that will last longer. 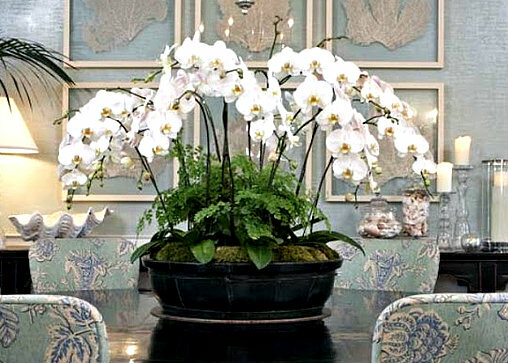 Healthy orchids bloom once a year, some two or three times a year. As your orchid collection expands into different types of plants, it's possible to have blooms throughout the year! Give all your orchids lots of light and cool temperatures at night throughout the growing season and they'll pick their time for blooming. After the blooms have faded away, orchids take a rest. They've worked hard all through growing and blooming seasons, and now, as their metabolism slows down, they take a break. This resting period corresponds to the dry season they experience in nature. Resting times vary with different types of orchids. Some plants actually go into a dormant period while others just slow down a bit. Plants that go dormant require cool, dry periods that can last 1-3 months. (cymbidiums and dendrobiums.) Dormant plants can only tolerate enough water to keep their roots from dehydrating. Overwatering is a common problem during this period. Other plants just slow down a bit during their resting season. (phaleanopsis, oncidium, and cattleya.) To copy nature, simply allow for longer dry periods between waterings for these plants. Let them sit completely dry for a week before rewatering. Also, skip the nutrients altogether. New growth signals the start of another growing season when plant care returns to normal.